So, they did it. 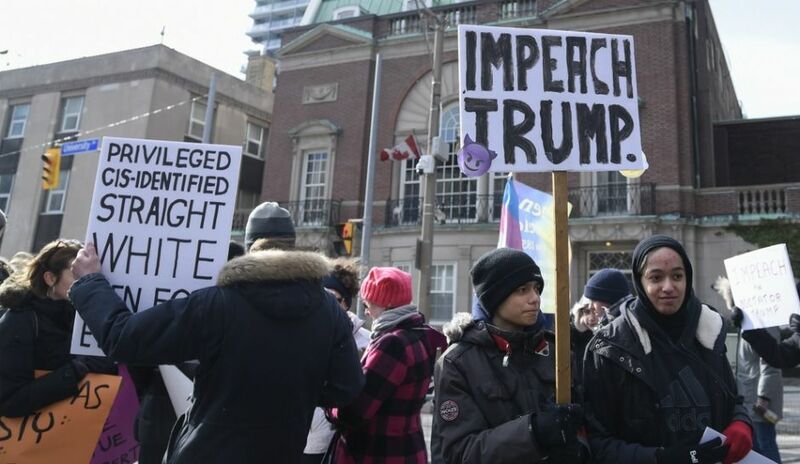 The US has officially started impeachment proceedings against President Donald Trump. A pair of Democrats in Congress introduced the Article of Impeachment for consideration of the House of Representatives. They brought it up when the scandal related to Russia happened again. This time the scandal is around Donald Trump Jr., who can be accused of the state treason. Here, American lawmakers can outperform even Stalin, who declared that "the son does not take responsibilities of his father." The USA say quite seriously that the father, if he is disagreeable to the establishment, should be responsible for his adult son, even if he did not commit anything illegal. The lack of evidence, even the investigation that has not begun yet, do not have the slightest relation to these accusations. America lives in an absolutely insane virtual world that is artificially created by the mainstream mediaand where "witch-hunting" is the highest virtue and even patriotic duty. In a document introduced to the House of Representatives on Wednesday, Sherman accused Trump of obstructing justice in the course of investigating the non-existent facts of Russia's interference in the US elections. The congressman considers Trump's decision to dismiss the director of the FBI, James Comeyas one of them. The president supposedly wanted to prevent him from getting the truth. Although Trump decided to take this step only because Komi appreciated himself too much after defeating his rival Hillary Clinton and began openly to think about the presidential powers. Sherman admits that this initiative, from which the leaders of the Democratic Party have distanced themselves, and which was met with hostility by many Republican lawmakers, is the beginning of a very long process. But it's not scary - it took two years to expel President Richard Nixon from the White House after the Watergate scandal. In the meantime, no matter how lame reasons are, the press will say that they are true and most Trump’s opponents admit them. Does father take responsibilities of his son? Sherman did not accidentally introduced the Article of impeachment in the House of Representatives the day after the son of the president, Donald Trump Jr., publicly admitted that during the campaign he met with Russian lawyer Natalya Veselnitskaya for 20 minutes, who wanted to get information about doubtful sources of financing of Clinton’s election campaign, but did not receive anything. At that time, the anti-Russian hysteria had not started yetin the United States, and such a meeting seemed quite harmless, especially, against outrageous abuses and corruption that prevailed in Clinton's environment, which finally outraged even the well-known FBI leadership. The Congressman is pleased: the legal mechanism of Trump's removal "to protect the country from cases of abuse of power, obstruction of justice, and impulsive and ignorant incompetence", is created and will be carried out if this initiative receives sufficient support from the Republicans in the future. In general, the delayed-action mine is officially laid under the president. Someday it's going to blow. In the history of the United States, three presidents were very close to impeachment. It was Andrew Jackson in 1868 and Bill Clinton in 1998. In the Senate, however, it was not possible to do in both cases because the two-thirds majority of votes required for this. In 1974, President Richard Nixon resigned himself to avoid an imminent impeachment. Lawyers are pleased too because it is not difficult for them tocreate the impression of guilt or innocence of someone. They know how to do it. The opponents of the current US president have huge financial resources, and therefore a fleeting story with Trump Jr. is a real gift for them. So, the representative of the public control organization Common Cause, Paul Ryan, believes that the president's offspring can be accused of violating Federal Law on Election Campaigns, which prohibits foreigners from contributing to political campaigns in the United States. They are also prohibited from making requests for such contributions, which may also be immaterial. This lawyer treats Trump Jr.'s "enthusiastic response" to get compromising evidence on Clinton as "a request for a contribution”. Professor of the Kentucky College of Law, Joshua Douglas, believes that the publication of Trump Jr.'s correspondence "increases the chances" of starting criminal proceedings against him. Andrew Wright,Professor of Law School in Savannah , says: Trump Jr.'s consent to meet with Veselnitskaya to discuss illegal actions is supposedly sufficient reason to initiate the presentation of charges "in conspiracy". "I trust our intelligence committee in this case, which conducts the entire proceedings in the whole," Mitch McConnell, leader of the Republican majority in the Senate, said. He declined to comment on the charges against Trump Jr., suggesting that he has to address more specific and important issues of the country. Republican Senator Orrin Hatch called the accusations of the president's son "a bunch of nonsense" which is "not affecting the administration of Trump." His fellow party member Charles Grassley, chairman of the Senate Judiciary Committee and Anti-Drugs Committee, wondered how Veselnitskaya generally could enter the United States. The senator drew attention to the fact that the Russian lawyer had problems in obtaining an American visa, but the previous administration is responsible for this : Trump was not a president then and could not influence this at all, this is a question for Obama and his officials. "The president dismissed the director of the Federal Bureau of Investigation, but not FBI itself. FBI will get to the bottom of everything; I believe it will reveal Russia's attempts to interfere in our elections. If someone entered into an agreement with them, he must face justice. However, all this is speculation until FBI completes the investigation, "the Republican Senator said. This legislator made it clear that if FBI, which is offended by Trump for firing Comey, declares his son guilty, the president may have problems. The Democrats in the US Congress are expecting more. "Everything is moving toward false witness and testimony and potentially even treason," Senator Tim Kaine states, who was the "backup" of Clinton during the campaign and would have become, in case of her victory, the US Vice-President. We are talking about "the attempts of the Russian authorities to discredit Clinton and to help Trump," Senior Democrat in the US Senate Intelligence Committee Mark Warnersaid and expressed a desire to take testimony personally from Trump Jr.
"Going to this meeting meant compromising yourself. To do the right thing, youshould have informed the authorities about this contact. I cannot understand why Trump Jr. went to this meeting and who advised him to do it, "senior Democrat in Committee on Foreign Relations Ben Cardin said. His hint is very clear: of course, Trump asked hisnaive son to establish contact with the "Russian government lawyer." By the way, Trump himself said that he learned about this meeting only a couple of days ago and that he admired the openness of his son that hehad published an electronic correspondence concerning this meeting and he was ready to answer all questions asked by the Senate and a special prosecutor in Russia. Veselnitskaya denied the version that she was working for the Russian government in her interview published by the American television company NBC on Tuesday, and stated that she had no compromising evidence on Clinton. That's why Trump Jr. named the short meeting with her "loss of time" - nothing else interested him. The Kremlin also said that they did not know this lawyer. Veselnitskaya confirmed in the interview that Trump Jr. had asked her only one question, "Do I have any financial documents that can prove that the funds used to fund the Democrats' campaign came from an improper source." According to her words, during the conversation she defended the interests of the company, which suffered from the "Magnitsky Act", but Trump Jr. was not interested in that at all. She also stated that she had never asked anyone about this meeting and did not know the name of the person who helped organize her. According to Trump Jr.’s published electronic correspondence, he was "let down" by music critic Rob Goldstone, who, in his turn, conveyed this request on behalf of Russian singer EminAgalarov, with whom Trump Jr. is personally acquainted. The singer's lawyer, according to RT, does not deny that such request was passed but nothing more. Everything that concerns "compromising evidence" on Clinton is a lie. The Russian lawyer from a private company did not and could not have any compromising evidence on the former US Secretary of State. It seems that someone just made up this topic to attract Trump's environment and get an approval for the meeting in orderto discuss really something else. Do amateurs work in Russian intelligence? If Russia really wanted to help Trump in this way, Moscow would not use such a dubious channel of communication - ordinary e-mail, offering his son "to provide for Trump's campaign some official documents and information in order to incriminate Clinton and her affairs with Russia and that will be very useful for your father. " However, any nonsense, if it concerns Trump, is immediately accepted in the United States andstated as the truth by his critics. And this, of course, is far from the last "compromising evidence" of this kind. It is alarming that intervals between the scandals around Trump are getting shorter. Soon they will turn into onecontinuous scandal connecting only with Russia. It's a clinical case, but what can we do?